It’s vendor-agnostic.The event is hosted by Third Door Media (which you know from SearchEngineLand.com, MarketingLand.com, SMX Search Marketing Expo), and conference chair Scott Brinker (@chiefmartec), co-founder and CTO of ion interactive, and author of chiefmartec.com. 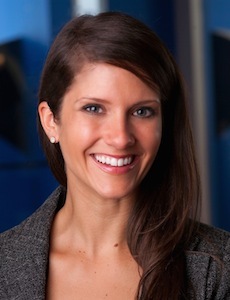 Brinker’s blog is one that’s recognized the potential, led the conversation, and paved the way for the intersection of marketing and IT since 2008. 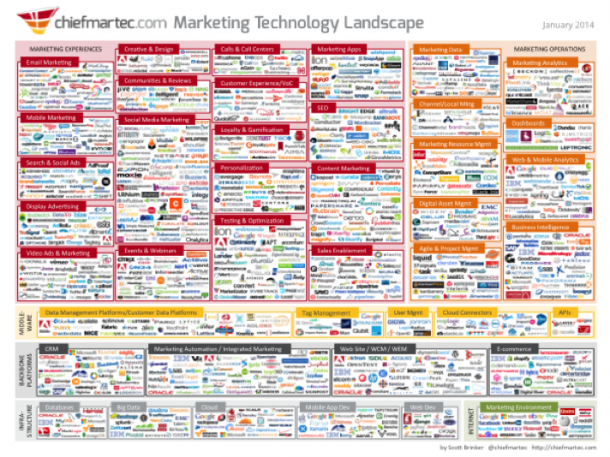 Better understand this: Scott Brinker’s 2014 Marketing Technology Landscape Supergraphic. Although the graphic is not all-inclusive, it is exhaustive and features 947 companies organized across 6 major classes—from marketing experiences through underlying platforms and infrastructure. Define your own marketing technology stack. While there’s no universal stack or key to the equation, strategically mapping out your organization’s current and future potential, among others focused on the same (and willing to share their own experiences), has become a core component of marketer’s responsibilities. This will be the conference with speakers and sessions dedicated to it. Grow and develop talent. As Jim Yu (@jimyu) writes, “digital marketers are in a constant state of professional growth.” As marketers keep pace with the proliferation of technology, this conference is sure to be good for your team’s professional development. Speaking of talent: Who doesn’t want to go to something coined the, “Festival of Unicorns?” It’s said the marketing technologist is part hybrid marketer, technologist and manager. 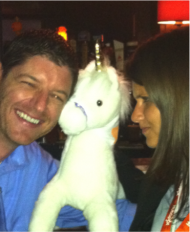 MarTech is sure to be filled with these innovating, like-minded individuals. Be a part of the marketing transformation. As Paul Roetzer (@paulroetzer) penned in The Marketing Agency Blueprint, “We are on the cusp of a truly transformational period in the marketing-services industry … The industry will be redefined by marketing agencies that rare more nimble, tech-savvy, open and collaborative.” The first of its kind, MarTech aligns with the nimble, tech-savvy, open and collaborative movement that is already shaping the industry. The people. This agenda and speaker list is packed … It’s going to be 2 days of non-stop marketing technology goodness, as more than 25 of the leading minds and practitioners in the space share their experiences. 22. Michael Krigsman (@mkrigsman), Co-Host of "CxO Talk"
Want to follow all the speakers above? Check out my Twitter list: MarTech Speakers. Boston. Who doesn’t like this city? While you’re there, catch a Redsox game at Fenway (they’re playing the Angels), hop on a Duck Tour, or walk down Newbury Street for some shopping. Whenever we visit this city, it’s a good time with good people. Interested, or attending MarTech? We’d love to connect, and say hello. Hope to see you there!